Striped and spotted cucumber beetles are two key insect pests of cucurbit crops. Without proper management, adult beetles can transmit bacterial wilt, defoliate plants and cause cosmetic damage to fruits. Larvae of the striped beetle also cause damage by feeding on cucurbit roots and stems. Managing these two pests in gardens and small farms can be challenging. Insecticides can be an effective control option, however harvest interruption due to pre-harvest intervals, and the potential impact on beneficial/pollinator species must be considered. Many of these insecticides will also be “restricted-use”, requiring private pesticide applicator training and licensing. 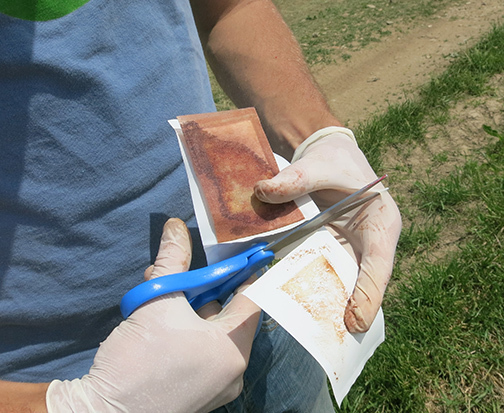 To address these concerns, the Lincoln University (LU) IPM program developed a simple, mass trapping system that has proven to be an effective component of an IPM strategy. When deployed in the cucurbit field, the cucumber beetles are drawn to the traps and away from the cash crop. Upon entering the trap, beetles are killed by their consumption of a carbaryl-laced bait. The three components of the trap are: (1) a juice / milk jug, (2) a commercial, floral-based lure , and (3) a stun pill composed of carbaryl (Sevin), paraffin wax, and powdered buffalo gourd. For additional trap details, see section ‘Trap Construction Using 1 Gallon Milk or Juice Container’ below. Results from research conducted (2011-2013) at the LU George Washington Carver Farm indicated that yellow-painted traps baited with the AgBio lure performed best. In 2011, 28 baited traps, maintained for a 9 day period, killed 2,531 cucumber beetles in a watermelon crop. This combined reduction of spotted and striped cucumber beetles reduced the need for an insecticidal spray while maintaining production of marketable fruit. 2015 on-farm study. On-farm research on mass trapping conducted at one commercial vegetable farm in Truxton MO, indicated that 28 traps killed 3,715 cucumber beetles (combining striped and spotted) over an 8-week period (21 May – 9 July, 2015). 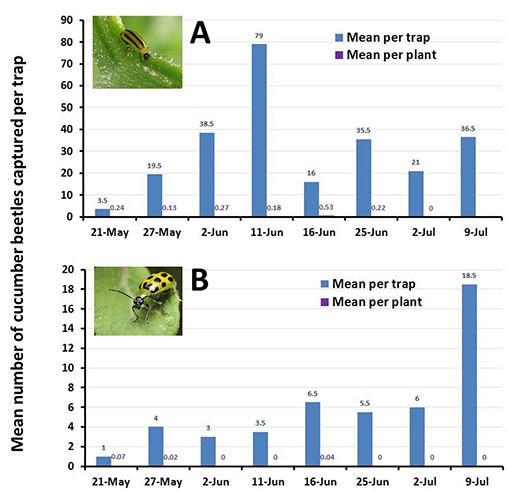 Comparatively high numbers of striped (Figure 1A) and spotted (Figure 1B) cucumber beetles were captured by yellow traps in a zucchini plot whereas very few adults were found on plants. Similar results were found in the cucumber plot (Figure 2A,B). Overall, the level of beetle suppression was so effective that the number of insects found on plants averaged 0.42 per plant, a number that is below what is called an economic threshold (= pest density at which insecticide applications are justified). Overall, our 2015 data indicate that, across the entire trapping period, for each cucumber beetle found on a plant, there were 26 cucumber beetles killed by a trap. Figure 1. Captures of (A) striped, and (B) spotted cucumber beetles in yellow-painted traps in a zucchini plot in Truxton, MO (2015 data). For each trapping date, blue bars show the mean number of beetles captured per trap. Purple bars denote mean number of beetles observed per plant. At each trapping date, 45 plants were inspected thoroughly for cucumber beetles. Figure 2. 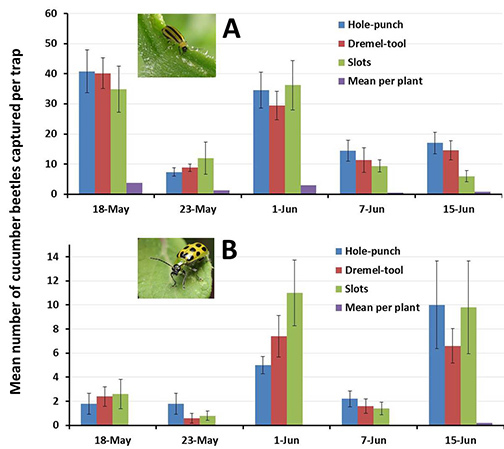 Captures of (A) striped, and (B) spotted cucumber beetles in yellow-painted traps in a cucumber plot in Truxton, MO (2015 data). For each trapping date, blue bars show the mean number of beetles captured per trap. Purple bars denote mean number of beetles observed per plant. At each trapping date, 75 plants were inspected for cucumber beetles. Mass trapping for Fall Sanitation. When cucumber harvest ended on September 25, 2015, a mass trapping system was deployed at the Truxton farm. This consisted of 15 yellow traps baited with the AgBio lure and one stun pill per trap. The goal was to kill as many cucumber beetles as possible to reduce the over-wintering population. When trapping concluded on December 2nd, 2015, a total of 2,043 cucumber beetles had been removed. These results are encouraging and two additional producers are evaluating the mass trapping system at their farms. 2016 on-farm study. The floral-based AgBio lure used in the traps and the yellow color of the trap can attract honey bees. Therefore, entrances should be sized big enough to allow cucumber beetle access, but exclude the honey bee. 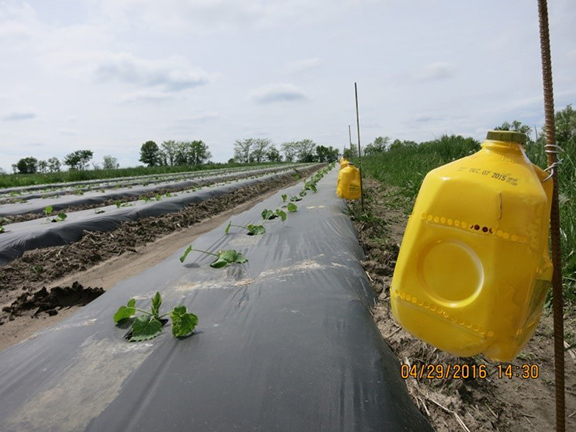 On April 29, 2016, 15 yellow-painted traps (Fig 3A) baited with the AgBio lure were deployed in a 2 acre planting of zucchini, yellow summer squash, and cucumbers in Truxton, MO. The objective of the replicated study was to measure the effectiveness of three different slot construction methods: (1) A high-speed cutoff disk mounted on a dremel-type tool made a uniform width slot, but blade thickness limited slot width to 1/8” width, (2) Cutting the slot with a knife allows it to be any width desired, but the difficulty of maintaining a consistent width often created a slot too wide, and (3) A hand-held paper-hole punch that made a ¼” diameter hole. A horizontal knife slit allows the hole puncher to be inserted and when completed, the container sides spring back to close the slit. FIGURE 3-B. The three types of entrance holes for cucumber beetles that were evaluated. The entire surface area is similar across opening types. Overall, the 15 traps killed 3,217 striped cucumber beetles in a 6-week period. The table below shows the combined beetle counts for all 15 traps, and the average number of beetles killed by traps and seen on plants. The ratio of beetles collected in traps versus beetles found on plants ranged from 7:1 to 23:1. The highest ratio of beetles per trap versus observed on plants was recorded three weeks after insecticide application, when the pesticide suppression effect should have diminished. This supports the observation that traps have the potential to keep cucumber beetles below the economic threshold for pesticide application. The new mass trapping system developed by the Lincoln University IPM program can be used as part of a broader IPM program aimed at managing cucumber beetles. FIGURE 4. Captures of (A) striped, and (B) spotted cucumber beetles in yellow-painted traps according to type of entrance hole in a summer squash plot in Truxton, MO (April 29 – June 15, 2016). Purple bars denote the mean number of beetles observed per plant. At each trapping date, 45 plants were inspected thoroughly for cucumber beetles. Overall, the conclusions of this study in terms of performance of the entrance hole are: (1) The 1/8” horizontal slot made with the dremel tool seems to be too narrow, (2) the free-handed knife slot would be too variable – yet effective if width can be kept at around ¼”, and (3) hole punch entrances excluded honey bees, and allowed maximum cucumber beetle captures. Only one honey bee (by a trap that had slots made with dremel tool) was captured over the entire 6-week trapping period. Overall, results indicate that the mass trapping system developed is effective at suppressing cucumber beetles from cucurbit plants. Some producers in a couple of Missouri locations are currently evaluating the performance of this mass trapping system. Trap Construction Using 1 Gallon Milk or Juice Container. Step 1: Trap entrances can be a series of round holes made by a paper punch tool, or horizontal slots cut with a knife or dremel-type power tool (see results described above). If using the paper-hole punch method, a horizontal knife cut will give tool access. Entrances on all sides of container aid in dispersion of lure scent. Remember, the scent can also be attractive to honey bees so keep the entrance small enough to exclude the honey bee, but still allow access to the cucumber beetle. A hole diameter or slot width of ¼” maximum has performed well. Step 2: Drop stun pill into trap. Unfold scent-lure and attach short piece of string/wire. Removal of the two protective white flaps (see Figure 5) also aids in scent dispersal. Insert through mouth of trap and catch string under screw-top lid such that the lure is suspended inside trap. Step 3: Drive a post along edge of vegetable row and suspend trap, with additional wire from container handle, so that trap is upright and approximately 4-6” above the ground. Step 4: Spray painting traps with yellow high-gloss paint has proven to increase effectiveness. Once installed, it can be easily sprayed in place. The commercial lure used is produced by AgBio, Inc. (Address: 9915 Raleigh St, Westminster, CO 80031; phone:(303) 469-9221; e-mail: agbio@agbio-inc.com. The stun pill can be purchased from Trece, Inc. (Address: 7569 OK-28, Adair, OK 74330; phone: (918) 785-3061; e-mail: custserv@trece.com).